Poly drug use refers to the use of two or more psychoactive drugs in combination to achieve a particular effect. In many cases one drug is used as a base or primary drug, with additional drugs to leaven or compensate for the side effects of the primary drug and make the experience more enjoyable with drug synergy effects, or to supplement for primary drug when supply is low. 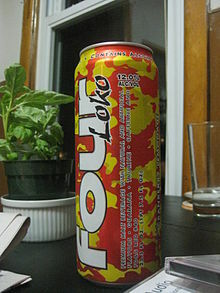 Caffeinated alcoholic beverages are widespread and legal. A caffeinated alcoholic drink is an alcoholic beverage that also contains caffeine, often in the form of an energy drink. The combination can result in reduced subjective alcohol intoxication but does not reduce in lowered objective intoxication. 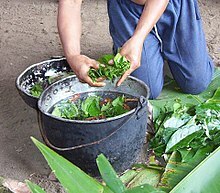 Ayahuasca is a beverage that combines monoamine oxidase inhibitors (MAOIs) and N,N-Dimethyltryptamine (DMT). DMT is normally inactive when taken by mouth due to being broken down by monoamine oxidase in the stomach, but the MAOIs block the enzyme action and allow the DMT to travel to the brain where it has a psychedelic drug effect. Pharmahuasca is like ayahuasca except that the DMT and MAOIs are mixed as pharmaceutical chemicals instead of plant extracts. A speedball is a mixture of cocaine and heroin. The combination is used because it is believed to provide more euphoria while having each drug balance out negative side effects from each other. The combination has a higher risk of overdose than of either drug alone. Cannabis Nicotine Blunt, spliff Stoned A rolled marijuana cigarette usually made with rolling paper. A blunt is a cigar hollowed out and filled with marijuana. It is rolled with the tobacco-leaf “wrapper” from an inexpensive cigar. Blunts take their name from Phillies Blunt brand cigars. Cocaine Heroin or morphine Speedball, powerball Speedballing, powerballing Speedballing, powerballing is often used to describe intravenous use. The term can also be applied to use of pharmaceutical opioids, benzodiazepines or barbiturates along with stimulants. Hashish LSD Royal Temple Ball The hashish is mixed with LSD and rolled into a ball intended for oral use, because LSD cannot be smoked. MDMA Ketamine GHB EKG. The “E” is for Ecstasy. Tranquillizers, sleeping pills, opiates and alcohol. Opioid-related deaths often involve alcohol. Poly drug use often carries with it more risk than use of a single drug, due to an increase in side effects, and drug synergy. The potentiating effect of one drug on another is sometimes considerable and here the licit drugs and medicines – such as alcohol, nicotine and antidepressants – have to be considered in conjunction with the controlled psychoactive substances. The risk level will depend on the dosage level of both substances. If the drugs taken are illegal, they have a chance of being mixed (also known as “cutting”) with other substances which dealers are reported to do to increase the perceived quantity when selling to others to increase their returns. This is particularly common with powdered drugs such as cocaine or MDMA which can be mixed with relative ease by adding another white powdery substance to the drug. This cumulative effect can lead to further unintended harm to health dependent on what is being covertly added. Concerns also exist about a number of pharmacological pairings: alcohol and cocaine increase cardiovascular toxicity; alcohol or depressant drugs, when taken with opioids, lead to an increased risk of overdose; and opioids or cocaine taken with ecstasy or amphetamines also result in additional acute toxicity. Benzodiazepines can cause death when mixed with other CNS depressants such as opioids, alcohol, or barbiturates. Within the general concept of multiple drug use, several specific meanings of the term must be considered. At one extreme is planned use, where the effects of more than one drug are taken for a desired effect. Another type is when other drugs are used to counteract the negative side effects of a different drug (e.g. depressants are used to counteract anxiety and restlessness from taking stimulants). On the other hand, the use of several substances in an intensive and chaotic way, simultaneously or consecutively, in many cases each drug substituting for another according to availability. The phenomenon is the subject of established academic literature. A study among treatment admissions found that it is more common for younger people to report polydrug drug use. ^ Nordrum, Amy. “The Caffeine-Alcohol Effect”. The Atlantic. Retrieved 7 August 2018. ^ Ferré S, O’Brien MC (September 2011). “Alcohol and Caffeine: The Perfect Storm”. J Caffeine Res. 1 (3): 153–162. doi:10.1089/jcr.2011.0017. PMC 3621334. PMID 24761263. ^ Malcolm BJ, Lee KC (January 2017). “Ayahuasca: An ancient sacrament for treatment of contemporary psychiatric illness?”. Ment Health Clin. 7 (1): 39–45. doi:10.9740/mhc.2017.01.039. PMC 6007657. PMID 29955496. ^ Ott, Jonathan (Summer 1996). “Pharmahuasca: On Phenethylamines and Potentiation”. Newsletter of the Multidisciplinary Association for Psychedelic Studies. 6 (3): 32–34. Retrieved 7 August 2018. ^ Negus SS, Gatch MB, Mello NK (June 1998). “Discriminative stimulus effects of a cocaine/heroin “speedball” combination in rhesus monkeys”. J. Pharmacol. Exp. Ther. 285 (3): 1123–36. PMID 9618415. ^ “Mixing Drugs”. Harm Reduction Coalition. Retrieved 7 August 2018. ^ Copping, Jasper (8 November 2009). “Drug slang: what police must learn A to B”. ^ Serfaty M, Masterton G (1993). “Fatal poisonings attributed to benzodiazepines in Britain during the 1980s”. Br J Psychiatry. 163 (3): 386–93. doi:10.1192/bjp.163.3.386. PMID 8104653. ^ Buckley NA, Dawson AH, Whyte IM, O’Connell DL (1995). “[Relative toxicity of benzodiazepines in overdose.]”. BMJ. 310 (6974): 219–21. doi:10.1136/bmj.310.6974.219. PMC 2548618. PMID 7866122. ^ Drummer OH; Ranson DL (December 1996). “Sudden death and benzodiazepines”. Am J Forensic Med Pathol. 17 (4): 336–42. doi:10.1097/00000433-199612000-00012. PMID 8947361. ^ Scholey AB, Parrott AC, Buchanan T, Heffernan TM, Ling J, Rodgers J (June 2004). “Increased intensity of Ecstasy and polydrug usage in the more experienced recreational Ecstasy/MDMA users: a WWW study”. Addict Behav. 29 (4): 743–52. doi:10.1016/j.addbeh.2004.02.022. PMID 15135556.